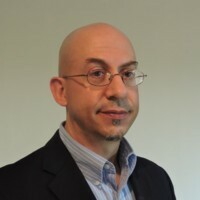 Home>Intellectual Infrastructure, Meet Our Staff, Staff>Michael C. Bradford, Ph.D.
Dr. Michael Bradford has over 20 years of R&D experience in the chemicals, automotive, and fuel cell industries, having worked at Exxon Chemical, Tenneco, Lilliputian Systems, and CeraMem Corporation. His primary areas of expertise include materials science, heterogeneous catalysis, kinetics, and reaction engineering. Prior to joining MATRIC, he served as a Technical Specialist in Tenneco’s Clean Air Corporate R&D team, during which he created and managed a global portfolio of new technology development projects directed at decreasing vehicle tailpipe emissions of criteria pollutants and greenhouse gases. Since joining MATRIC, he has provided leadership and technical support to several projects.